Yesterday I talked about apparent sizes, and how Pluto can appear smaller than a distant galaxy, even though the galaxy is much farther away. 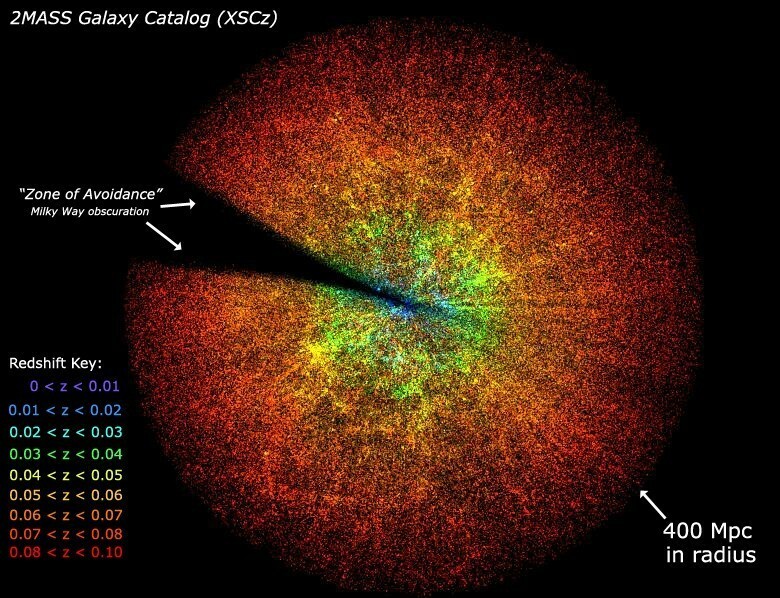 It turns out, however, that on really cosmic scales apparent size is only part of the story. That’s because the universe is expanding. In astronomy we generally don’t talk about the distance of far galaxies. Instead we refer to their redshift, often known as z. The reason for this is that the redshift of a galaxy is pretty unambiguous. You measure the spectrum of a galaxy, then compare a known emission or absorption line with what we observe here on Earth. From the difference between their two wavelengths, we can calculate z. 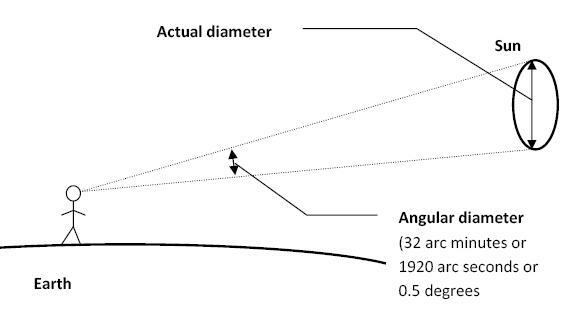 Calculating angular diameter. Credit: Wikipedia. Now it is basically true that the bigger the redshift a galaxy has, the greater its distance. But because the universe is expanding, there are different distances that can be defined. You can, for example, define distance by the time it has taken light to travel from the galaxy to us. We can define distance as how far away the galaxy was when its light began its journey. We can define distance as how far away it is now. So for example, a galaxy with a redshift of z = 3 was about 5.2 billion light years away when the light we observe left the galaxy. The light travelled for about 11.5 billion years, and the galaxy is now about 21 billion light years away. That can be a bit difficult to wrap your head around, which is why we typically just stick with z. 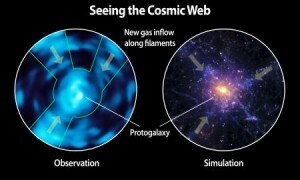 Strange as all this is, it has a very real effect on what we observe in the distant universe. 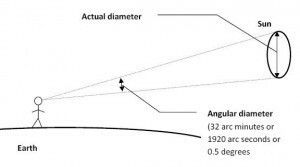 When we talk about apparent size, we usually refer to an objects angular diameter. This depends upon its actual diameter and its distance from us. In a static universe everything would be simple, and the more distant an object is, the smaller its angular diameter would be. But cosmic expansion changes all that. Since the universe is expanding, distant objects will appear to increase in size. The object isn’t getting larger, but as the universe expands the light traveling from a distant galaxy appears to spread out a bit. For closer galaxies this isn’t significant, but for distant galaxies it is. For close galaxies, the greater the distance, the smaller their apparent diameter, but around z = 1.5 cosmic expansion becomes a bigger factor than the galaxy’s distance. As a result, galaxies with higher redshifts actually start appearing larger. The most distant galaxies can appear significantly larger than closer galaxies. This doesn’t mean that distant galaxies are actually larger, simply that they appear larger due to cosmic expansion. What’s particularly interesting about all this is that we can use this effect to determine the way in which the universe is expanding. This is part of the reason we know the universe contains dark matter and dark energy. But that’s a story for another day. I would like to thank you for all the astronomical information given to us, its really interesting and you are very good teacher. When I read that you worked on the farm so I concluded that you have both theory and practice in your veins. Keep it up. Thanks Again. There’s a typo here. How far away is this galaxy now, really? 21 billion light years away. I figured this post would attract the electric universe spam. Didn’t take long. If the universe is 14 billion years old how can a galaxy be 21 billion light years distant ? Because space itself is expanding. This post goes into the details of how that is possible. It’s very scientific, because it is supported by scientific observation. Strange as it seems, it is what the universe does. Scientific observation that space (nothing) is expanding what instruments are used for this . You cannot measure the size of space , it’s like trying to measure the height of height. Actually, we can model space in terms of general relativity, which is supported by a great deal of observational evidence. In terms of how we know that space is expanding, we can compare things like redshift vs galaxy brightness or angular size. We can distinguish between a universe where the galaxies are physically moving away from us and one in which space is expanding. I’ve talked a bit about that here.